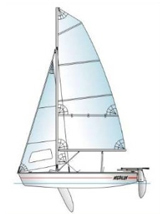 Hull length: 3.7 m Hull width: 1.5 m Draught: 0.12 / 0.80 m Sails area: 7 / 8.5 / 10 sq. m Mass of hull: 85 kg Crew: 3 persons / max 250 kg Designer: Marek Jankowski M. Eng. MERLIN is fast, has good turning ability and is very safe. We are sure that it will never let you down and will let you discover the true taste of yachting. The yacht can be adjusted to suit your needs by ordering additional accessories. Our yachts are sold ready to sail, with rig, all fittings and ropes (including mooring rope). The hull is built of glass hardened polyester laminate. The deck is a sandwich structure to increase its resistance and rigidity. The non-skid surfaces are moulded and therefore they may slightly differ in colour from the rest of the deck. The mast and boom are made of anodised profiles of aluminium alloy, sails of dacron, while the forestay and shrouds - of stainless steel. Standard sails have horizontal cut, with red MERLIN logo. The basic yacht colour is white. Other colours of hull, deck or non-skid surfaces may be ordered at extra cost. The colour range is available here. Other RAL colours are also available, at higher cost. We offer also individual graphic designs made of foil or airbrush painted.